We already responded to a Dec. 11th straight news story by Phoebe Greenwood, the Guardian’s new Israel correspondent, which implicitly questioned the validity of evidence consistently offered by Palestinian Media Watch of incitement in Palestinian schools. However, her report was not a polemic, and thus, by merely citing Palestinians who questioned PMW’s work, protected her from charges that she similarly possessed such doubts. The wonderful thing about Twitter, however, is that it often provides a glimpse into the political views of correspondents who otherwise hide their ideological orientation behind rhetorical obfuscation. 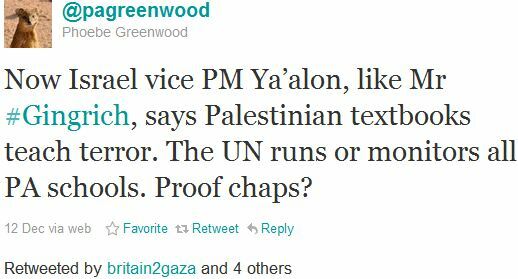 As such, a recent Tweet confirms that Greenwood indeed doubts whether such incitement permeates Palestinian schools and textbooks. Okay, Ms. Greenwood, I’ll take that challenge. In 2006, the Palestinian Authority Ministry of Higher Education introduced new 12th grade schoolbooks written by Palestinian educators who were appointed by the Fatah leadership. PMW reviewed these books and found that they make no attempt to educate for peace or coexistence with Israel. Instead Israel’s right to exist is adamantly denied and the Palestinian war against Israel is presented as an eternal religious battle for Islam. Rejection of Israel’s right to exist: Israel’s founding was “a catastrophe that is unprecedented in history”. While “Palestine” is described as existing in a world without Israel, Israel’s founding is taught and vilified as “a catastrophe that is unprecedented in history. 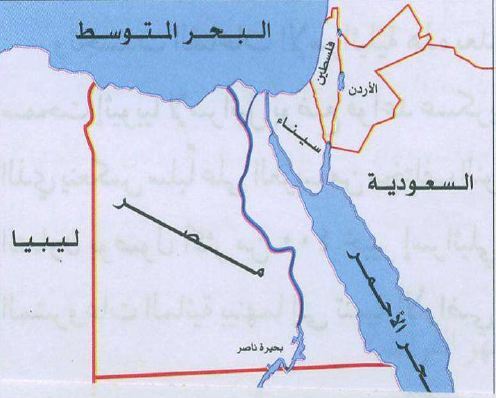 The Zionist gangs stole Palestine and expelled its people from their cities, their villages, their lands and their houses, and established the State of Israel.” [Arabic Language, Analysis, Literature and Criticism, grade 12, p. 104] Israel is described as foreign, colonialist, and imperialist. The youth are taught that Israel’s creation was immoral and Israel unequivocally has no right to exist. Holocaust Denial: World War II without a Holocaust. The textbook History of the Arabs and the World in the 20th Century teaches the military and the political events of World War II in significant detail, including sections on Nazi racist ideology, yet neither persecution of Jews nor the Holocaust is mentioned. It is apparent that the PA educators made an active decision to exclude the Holocaust from history. The new book writes selectively about the issues of the Holocaust, citing Nazi racist ideology and restrictions the Nazis placed on “inferior” non-Aryan nations, yet it makes no reference to the Holocaust or to Jews. Jihad, and Shahada – Martyrdom for Allah. The new PA schoolbooks teach and idealize Jihad – war for Islam — and Shahada – death for Allah – as basic Islamic principles to which to aspire. Jihad and Shahada are at times taught as general Islamic ideals, and at times focused against Israel. This promotion is not limited to the formal Islamic education books, but is found in many different schoolbooks. Often the original Islamic sources from the Quran or Hadith are used as the tool of promotion. So, if Ms. Greenwood wishes to dispute PMW’s translations she can do so. But, more likely, as with so many anti-Zionist activists (journavists) who happen to find gainful employment writing for the Guardian, not even the most irrefutable evidence regarding endemic antisemitism and incitement within Palestinian society could penetrate Greenwood’s rigid ideology. As it’s impossible to really understand the Israeli-Palestinian Conflict without understanding such Palestinian racism against Jews, such antisemitic sins of omission by the Guardian’s Israel correspondents will continue to ensure that the paper’s vast audience will remain thoroughly ignorant of the dynamics which really represent the root cause of the conflict. And when you do give links to the proofs of Cif, they delete your comment so that the likes of Phoebe always stays ignorant and stupid. Ms Greenwood is a foreign correspondent for the Guardian. You’re not. That’s all the difference. What next Nat? Going to stick your tongue out, put your thumbs in your ears, waggle your fingers and say “Ner, ner ne-ner ner”? Great blog Adam Levick. Keep up the good work. “Proof chaps”…..Is a dumb arrogant and ignorant request from someone who writes about the ME. “We set the agreement’s pillars, and Hamas agreed with us that resistance will be popular and adopt peaceful ways, rather than military resistance.” Peaceful resistance? Sun Tzu says ‘War is deception’.